Aluminum frames offer exceptionally easy maintenance. To maintain the appearance of your Homecrest Outdoor Living furniture, regular care and maintenance of the aluminum frames is recommended. Coordinate the care of frames with the amount of use or exposure to the elements or use conditions. Wash or spray down the frames with clear water or with mild soap and water to remove dust, pollens, chemicals, salt water, dirt, etc. Avoid the use of any abrasive cleaners and power washers. To maintain the finish of the painted surface apply a coat of clear liquid car wax at least once a year for additional protection from the outdoor elements. Overtime the finish may dull, just the same as if a car is not waxed. Use of the wax will retain or repair an exposed finish. Product that is in use in a coastal environment may experience additional demands on the surface finish due to the salt air. A weekly or biweekly cleaning of product is recommended to clean away any buildup of salt residue and the possibility of oxidation. Quarterly waxing of the finish is recommended, to maintain a strong finish that will withstand the demands of this type of environment. If regular maintenance is not preformed and the finish experiences blistering the warranty on the finish would be void. If the climate of your area experiences freezing conditions do not store any product upside down. Moisture can accumulate in the frames and when frozen can crack, distort or break the frame tubing. If the finish becomes scratched or chipped, first sand the affected area lightly with fine steel wool or 400 to 600 grit sand paper for better paint adhesion. Wipe clean the area to be painted. Holding the can 8 – 10 inches away from the area, apply thin coats of paint, allowing ample time for paint to dry between coats. Do not try to cover the area with the first coat as it may result in the paint running, change in the surface texture or the gloss of the finish. Cover any adjacent areas to avoid overspray. A small amount of paint may be sprayed on a separate surface and using a small artist brush, cover the affected area. If you are working with a finish that consists of multiple colors you may want to test on a piece of cardboard or other material. Start with the "base" coat, holding the can 8 – 10 inches away apply light coats and allow to dry 3 – 5 minutes. Next, maintaining the same distance, apply light spurts of the color until the desired look is achieved. If the area becomes too light, after the finish has dried, apply a light dusting of the base coat. Powder coating is a technique employed by Homecrest Outdoor Living for finishing metal frames. A powder-coated surface is durable and requires limited upkeep. Tip: Contact your dealer for touch up paint. Always store your touch-up paint upside down to avoid the nozzle from becoming plugged. Steel frames can be easily maintained and prompt attention to a scratch or chip prevents the exposure of steel to the elements. To maintain the appearance of your Homecrest Outdoor Living steel furniture, regular care of the frames is recommended. Coordinate the care of frames with the amount of use or exposure to the elements or use conditions. Wash or spray down the frames with clear water or with mild soap and water to remove dust, pollens, chemicals, salt water, dirt, etc. Apply a coat of clear liquid car wax at least once a year to protect the finish of your product. Where humidity is high, some corrosion is inevitable; catch it early. If corrosion has occurred, clean the area with Extend (found in most hardware stores) following manufacturer's instructions, or clean with naval jelly rust dissolver, let set for a few minutes and wipe clean. Repeat if necessary. Lightly sand the affected area with a fine steel wool or with 400 to 600 grit sand paper for better paint adhesion. Wipe clean the area to be painted. Holding the can 8 – 10 inches away from the area, apply thin coats of paint, allowing ample time for paint to dry between coats. Do not try to cover the area with the first coat as it may result in the paint running, change in the surface texture or the gloss of the finish. Cover any adjacent areas to avoid overspray. For a small chip or scratch, spray a small amount of paint onto a separate surface and using a small artist brush, cover the affected area. If you are working with a finish that consists of multiple colors you may want to test on a piece of cardboard or other material. Start with the "base" coat, holding the can 8 – 10 inches away apply light coats and allow to dry 3 – 5 minutes. Next, maintaining the same distance, apply light spurts of the color until the desired look is achieved. 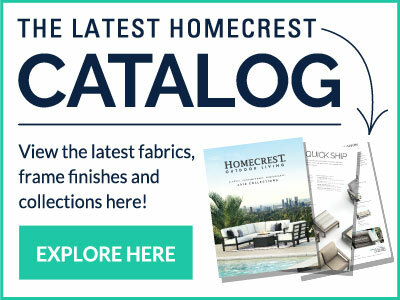 If the powder coating is a technique imployed by Homecrest Outdoor Living for finishing metal frames. Powder coating is a technique employed by Homecrest Outdoor Living for finishing metal frames. Steel frames incorporates a baked on primer coat along with the powder coat finish creating a durable surface that requires limited upkeep.